Product code: D105 Categories: Animal & Bird, Browns, Cotton, Fabricland, Luxury Fabric. 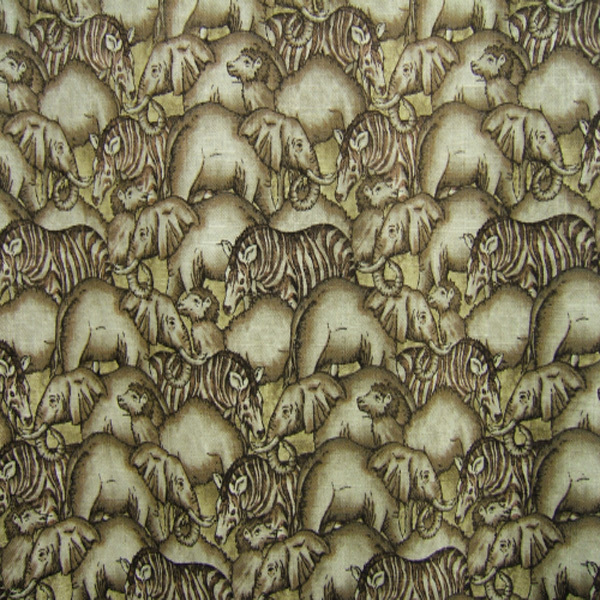 Animals in brown by Fabricland is one for animal lovers! How many animals can you see? There are elephants, zebras and lions making their way across the fabric. There is a good pattern coverage making this a great fabric for a range of interiors including cushions, curtains and blinds. Would be suitable for a childs playroom or for an animal lover. This is a good quality cotton fabric by International Textiles for Fabricland. The fabric measures 1 metre 40 centimetres wide with a pattern repeat of 44cm. It is suggested that this fabric is best treated as Dry Clean Only.